Today I am beginning a series of studies that will explore the social and economic policies of Solomon. These studies will show that Solomon’s success and his desire for glory and wealth perverted the covenant traditions of Israel and placed in jeopardy the very promise which God had given to Abraham and through him to Israel. This series of studies will deal with the problem of social oppression during the reign of Solomon. In the process, I will describe the oppressive policies Solomon put into place in order to establish his kingdom, to build the temple and the palace, and maintain his opulent lifestyle which corrupted the very stability of his empire. Like most of the central figures in the Hebrew Bible, Solomon is a mass of contradictions. He is wise, cosmopolitan, an astute merchant prince with fabulous wealth. He is also an oppressive dictator who taxes his subjects into poverty. Phoencian Baal-worshipers designed and supervised the construction of his crowning achievement, the temple of Yahweh in Jerusalem, and conscripted Israelite laborers did the work. And yet, even Jesus remembered “Solomon in all his glory,” and the postexilic Chronicler saw fit to adapt the story of Solomon to further his messianic vision of Israel’s glorious future. All of us have it within ourselves to be both a monster and a saint. The greater our gifts, the greater the potential in either extreme. Why Was David Tending the Sheep? October 21, 2009 11:27 am / 5 Comments on Why Was David Tending the Sheep? The introduction of Saul stands in sharp contrast to the first mention of David, the second king of Israel. The prophet Samuel is told by God that one of the sons of Jesse will be the next king. Noting that the Lord hasn’t chosen any of the first seven sons of Jesse, Samuel asks the father if he has any other sons. Jesse responds, “There remains yet the youngest, and behold, he is tending the sheep” (1 Samuel 16:11). When we meet David, he’s watching over his family’s livelihood. The Hebrew word for youngest, qatan, implies insignificant and unimportant. One translator even uses the word “runt.” Though David is the runt of the litter, God selects him to rule over Israel. In the Bible, the younger siblings are often responsible for shepherding, while the older children are given more important jobs. Though Cain is older, Abel keeps the animals. While some shepherds were strong like Abraham’s son, Issac, who makes the Philistines jealous with his abundant flocks (Genesis 26:14), many times the younger brothers or even daughters care for the sheep. Rachel, the younger sister of Leah, is recognized as a shepherdess. In fact, while watering sheep at a well, she meets Jacob and eventually falls in love (Genesis 29:2–11). I couldn’t believe what Lynne was saying. Those considered the weakest members of society—the children, women, and the elderly—were sent out to protect the sheep. Within this context, the story of David made more sense to me. David isn’t just the youngest brother; he’s the least qualified choice in the eyes of everyone. He takes care of the sheep, because everyone else in the family has more important duties. Samuel’s selection of David must have shocked them all. According to the Masoretic Text, Goliath’s height was “six cubits and a span” (1 Sam 17:4), or slightly over nine feet tall. However, Josephus, the Septuagint, and the Dead Sea Scrolls Hebrew text of 1 Samuel both give a more modest “four cubits and a span.” J. Daniel Hays (“Reconsidering Goliath’s Height,” JETS 48/4 [December 2005] 701-14) cogently argues that this variant reading is in fact correct on both text-critical and literary grounds. 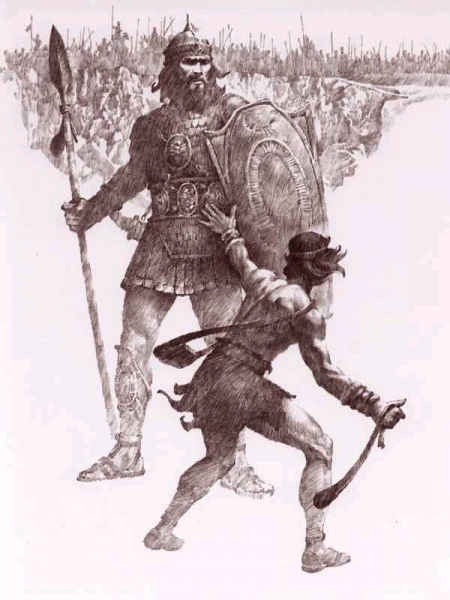 To someone standing 5′ 5″ to 5′ 9″ (165–174 cm) tall, Goliath may well have fallen into the category of “giant.” He would have been about a foot taller and had a weight advantage of perhaps 80 pounds (36 kg). But Goliath was not the only tall fellow in the valley of Elah. According to 1 Samuel 9:2, Saul “stood head and shoulders above everyone else.” This may well be hyperbole, but at any rate Saul is also remembered as being unusually tall. A normally proportioned adult male stands eight “head units” tall. To be literally “head and shoulders” above someone, a man would have to be taller by 1.33 head units, or about 11 inches (28 cm) taller given the average height range Gabriel has provided. In other words, Saul may have been roughly the same height as Goliath—most likely a bit shorter, but at least possibly an inch taller. Saul also possessed impressive armor. We’re never told precisely what his armor was like, as is the case with Goliath (vv. 5-7), but it included a helmet, a mail coat, and a sword. We do know that David found it cumbersome to wear when Saul insisted he put it on (vv. 38-39). When Goliath demands an Israelite champion to fight with him (vv. 8-10), Saul ought to have accepted the challenge. After all, hadn’t God anointed him to “save [Israel] from the hand of their enemies all around” (10:1)? Wasn’t that what the people wanted when they demanded Samuel find them a king—”that our king may govern us and go out before us and fight our battles” (8:19-20)? Like Goliath, Saul was large and well-armed. And yet Saul’s reaction to Goliath’s trash talk is not resolute action but dismay and fear (17:11). This was supposed to be the story of “Saul and Goliath,” but nobody remembers it that way because Saul flaked out. When Samuel went to Bethlehem looking for Israel’s next king, he first considered anointing David’s eldest brother, Eliab. But God advised him, “Do not look on his appearance or on the height of his stature…for the LORD does not see as mortals see; they look on the outward appearance, but the LORD looks on the heart” (1 Sam 16:7). So Samuel anointed instead the youngest son of Jesse, and in the valley of Elah it was the unarmored shepherd with his staff and his sling who slew the Philistine, not the tall, heavily armed, regal figure who was supposed to be Israel’s champion. In God’s economy, the real “champion” is often someone who doesn’t seem terribly impressive on the surface, and those who put their hopes on an outwardly appealing figure are likely to end up “in distress,” “in debt,” and “discontented” (1 Sam 22:2). May 14, 2008 4:11 pm / 1 Comment on Where’d He Get That Idea? In 1 Samuel 18:20-30, Saul demands of David the foreskins of 100 Philistines as a kind of “bride price” in order to marry his daughter Michal. Not to shrink from a challenge, we are told that David went out and killed 200 Philistines and presented Saul with the requisite tribute. I’m pondering where Saul got the idea that a pile of Philistine foreskins would make an appropriate gift. The obvious answer would seem to be Egypt. At the temple of Ramesses III at Medinet Habu, there is in fact the depiction of piles of the severed penises and hands of the pharaoh’s enemies. Among foreigners who did not practice circumcision (such as Libyans and Hittites), the male organs were removed, tallied (soldiers were rewarded according to the number of slain enemies) and perhaps kept as war trophies. If, like the Egyptians, the foreign casualties were circumcised, the right hand served the same purpose. Diodorus Siculus seems to report the same kind of depiction at the Ramesseum of Ramesses II, but it is doubtful whether he saw the structure firsthand and, at any rate, his report is quite garbled. There is also an un-illustrated textual description of the same practice found at Karnak and describing the practice during the reign of Merneptah. As far as I have been able to ascertain, this is the sum total of Egyptian evidence for the practice of taking the penises of slain foes as war trophies, a 120-year interval spanning the 19th and 20th Dynasties. In conventional chronology, we’re in the 13th and early 12th centuries. Saul, however, would have reigned in the late 11th century. So I’m wondering if there is other documentary evidence I’ve been unable to track down, either of the same custom enduring in Egypt into later times or of the custom being practiced by other cultures in the Ancient Near East. In the absence of such evidence, might this strange story from 1 Samuel be circumstantial evidence in favor of a circa 200-year down-dating of Egyptian chronology such as proposed by Jeremy Goldberg or Pierce Furlong?